Food service job training for individuals facing barriers to employment. Community Servings’ Teaching Kitchen program is a 12-week job-training program for people interested in careers in the food service industry who face barriers to full-time employment. 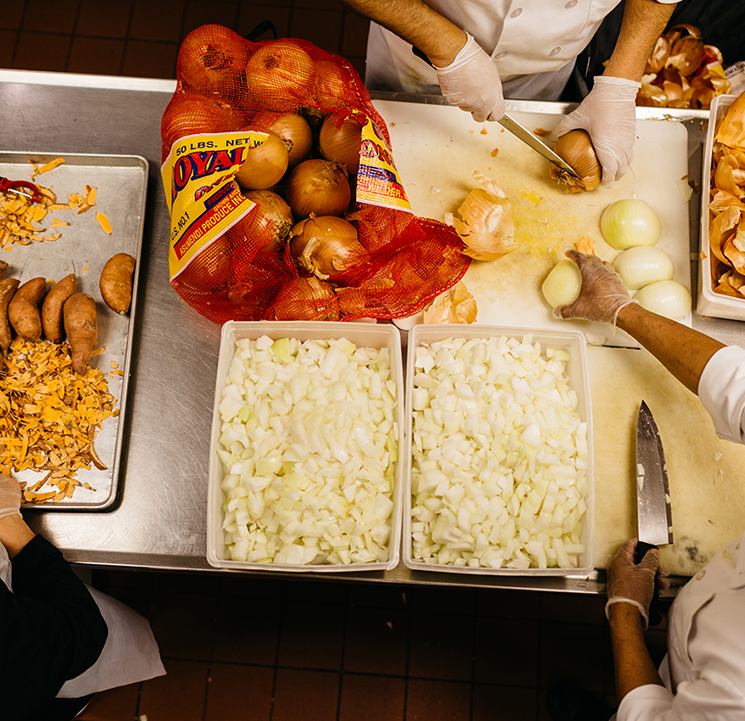 As they learn food preparation and cooking techniques, trainees also help our culinary team prepare the meals we deliver to our clients each day. Our state-of-the-art industrial kitchen provides an exceptional training venue for applying this well-structured and hands-on learning experience. The Teaching Kitchen’s 12-week curriculum covers all facets of working in a professional kitchen, including food safety and sanitation, knife skills, cooking techniques, and nutrition. Four courses are offered throughout the year and classes are held Mondays – Thursdays from 9am to 4pm, and Fridays 7am to 2pm. To apply, please fill out this form. To learn more, contact Allison, Job Readiness & Employment Manager, at allison@servings.org or 617.522.7777, ext. 206. Eighty-three percent of last year’s graduates were placed in jobs. Seventy-three percent of trainees who take the ServSafe exam, pass. Trainees receive ongoing resume, interview skills, and job search assistance while in the program and for a year after completion. Following graduation, our trainees work in a number of food service settings, including colleges and universities, nonprofits, catering businesses, grocery stores, hotels, and restaurants. While trainees are learning about different cooking methods and safe food handling, they’re also helping us prepare meals for our clients – it’s a win-win!